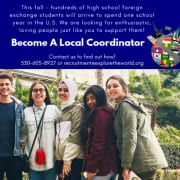 ACES is currently hiring local coordinators for our high school foreign exchange program throughout the United States. Local Coordinators are an integral and indispensable part of ACES program operations. They represent the organization and its programs in their local communities and work from their own home office. The men and women who serve as Local Coordinators are from all backgrounds, experiences and walks of life. They all share an interest in promoting global understanding through international exchanges and enjoy spending time with individuals from around the world. Are eager to develop relationships with schools, host families, and others in their local community. What responsibilities do Local Coordinators have? -Securing host family and school placements. -Conducting orientations for program participants and host families. -Supervising program participants and assisting with issues as they arise. -Maintaining relationships with schools and host families. Aside from the fun, excitement and rewarding experiences you will have with your program participants, host families, schools and others in your community, ACES Local Coordinators are given a stipend for their work and commitment. Additionally, Local Coordinators who place a minimum number of high school program participants are invited to attend the ACES National Meeting, which is held yearly in the spring. Occasionally other travel opportunities are offered as well and depend on a variety of factors. What is my obligation to ACES? Local Coordinators choose the number of students they place and are never obligated to take on more program participants than they feel comfortable working with. Together with ACES, Local Coordinators match host families and program participants for a successful exchange experience. We are looking for people willing to commit at least 10 hours a month. You can work as much as you'd like.